Home » News » Announcements » War of the Ring Second Edition in Polish! 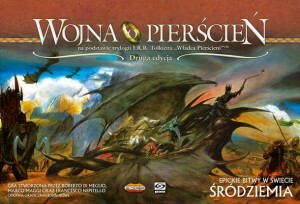 War of the Ring Second Edition in Polish! A new international partnership has been announced for War of the Ring Second Edition: the game will be published in Polish by Galakta, the leading game publisher of fantasy and sci-fi board and card games in Poland. The Polish edition will be released in spring 2012 together with the German, Italian and Spanish editions. “We are glad to take part in such a great project as War of the Ring. There are many fans of Tolkien’s trilogy in our country and we believe that they will find many great experiences during their play sessions with this game”, said Dariusz Waszkiewicz, CEO of Galakta. “We are working with skilled international game publishers to publish the new edition of War of the Ring in different languages, to give to non-English speaking players the chance of playing the game fully and of enjoying the setting in the best way. Galakta is a great company and will surely match the Polish players’ expectations”, declared Christoph Cianci, CEO of Ares Games. Ares Games had already announced the partnerships with Devir (Spain), Heidelberger (Germany), and Red Glove (Italy).